Day 2 of Tolkien Week (Here is yesterday’s humble offering). One of the mind-boggling accomplishments of this Oxford professor was that he invented an entire language. Sure, you might say, he was a philologist, but how many other philologists wrote a language that lived up to every criteria that philologists consider critical to a complete language (In the interest of transparency, I have no idea)! Here is a great tribute to this aspect of Tolkien’s expertise: one of his disciples singing Happy Birthday to him … in elvish! This is a rare gem. That an author could possibly make up an entire language is mind-blowing. Yet we often forget that beyond the dragons, swords, and quests, J.R.R. 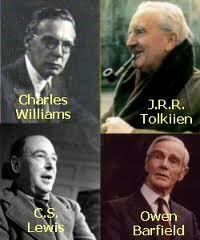 Tolkien created an entire language. 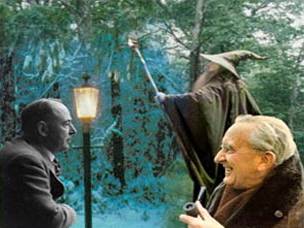 As a professor of philology (ancient languages) at Oxford University, Tolkien was already immersed in the mechanics of how a language is put together. But the professor took it to another level when he actually made up a language. With the hype beginning to build for The Hobbit movie, this poem surfaced read by the master himself. My own elvish is somewhat rusty, so here is a translation of Namarie (Farewell) courtesy of Josh Jones, who goes into greater detail about the when and where. song of her voice, holy and queenly. those from the East is Valimar! even thou shalt find it. Farewell! And, in case you haven’t got enough, here is Tolkien again, reciting the Song of Durin (in English).